Players and Officials Letting Golf, and Us, Down. It’s time for golf to get a grip on itself – literally. Seemingly every week nowadays the top players of the world are making headlines – for all the wrong reasons. What happened to no one player being bigger than the game? As long as I’ve been involved in golf – over a mere half century – the sport has set itself apart from others in terms of its stringent self-policing and integrity. Alas, a great deal of that seems to have gone out the window. Michael Bamberger, writing for golf.com this week, pinpoints one of the key moments he feels things began to change. Many of you will remember it well – the 2013 Masters on the 15th hole when Tiger took an incorrect drop? It only came to light in Tiger’s press conference after the round and after his card had been signed. He stated he went back a few extra yards to give himself a better yardage in to the flag – something he was not entitled to do under that rule. It was an innocent mistake, a bungling mix of two different dropping procedures, but a clear cut transgression. It should have resulted in disqualification. But it didn’t. Too facile, perhaps, to say this is where it all started? Tiger’s incorrect drop at the 2013 Masters. He should have done better, though, in the aftermath. Is Bamberger right in that? Is there really an increasing divide between the top proponents of the game and the ruling bodies? Just cast your mind back over the last five years. The raft of high-profile rules rows has kept some of us entertained and appalled in equal measure. There was Dustin Johnson at the 2016 US Open, penalised two shots for supposedly having caused his ball to move on the green. He had played a good half dozen holes before he was informed that a penalty was possible – and was then left to complete his final round, trying to win his first major, without any idea what his overall score was. In the end, he won by enough to make the penalty irrelevant to the outcome, but the handling of the situation by the rules officials was woeful. More grist to the mill in the them-against-us scenario. Lexi Thompson failed to replace her ball correctly on the 17th green in the third round of the ANA Inspiration in 2017. Another final round fracas in a major ensued as it was only during the final six holes on Sunday that she was informed she was being handed a 4-stroke penalty as a result of her actions the previous day – two for the incorrect replacement and two for subsequently signing for a lower score than she had. A viewer had called in a day late and the relevant video footage was scrutinised. This moved Lexi from holding a 3-shot lead to being one behind with six to play. She forced a play-off with So Yeon Ryu but lost at the first extra hole. There was an outpouring of support for Lexi from many quarters, including Tiger Woods and other touring pros, and generally dismissive contempt for the viewer who called in. But, what seemed to me to be overlooked in all the goings-on was that Lexi DID break a rule. End of story. It wasn’t the fault of the viewer who rang in – or the officials. Under the rules at that time, matters had to be investigated, which they were, and the correct action was taken. It IS important to protect the rest of the field. The recent rules changes now mean that no credence is given to viewers ringing in – the tournaments now have a designated official watching the TV pictures. Neither can you have another penalty lobbed on top of a first one. Both good changes. Lexi Thompson broke the rules, but many of her fellow professionals felt she had been cheated of her second major title. Add to that that only a couple of weeks ago the USGA declared themselves satisfied with the rolling out of the rules changes and it’s easy to see, therefore why confidence in them is at an all-time low. Martin Slumbers, chief executive of the R&A, had the good sense to admit that it hadn’t been as straightforward as he had hoped and that they had a few things to work out. 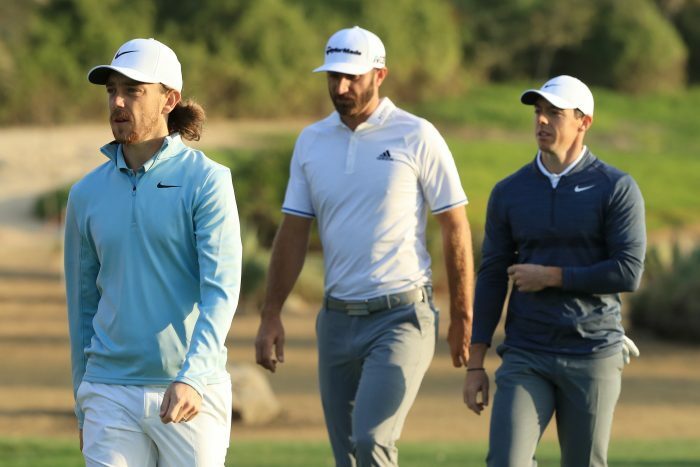 Many PGA Tour players are openly ridiculing the new rules on social media and firmly laying the blame at the door of the USGA. Don’t get me started on the Justin Thomas debacle. Of course, everyone is entitled to their grievances and opinions but golf risks losing the moral high ground it has enjoyed over other sports for so long. It IS important how you interact with others and put over your complaints and concerns. Descending to mudslinging on social media sites risks highlighting the “me, me, me” world of professional sport and alienating the fans who are largely responsible for the players being able to compete for so much dosh. The players have justifiable concerns but it is very important they also take a long hard look at themselves. Phil Mickelson let himself, and his professional colleagues, down with his ridiculous display of hitting a moving ball on one of the greens at Shinnecock Hills in last year’s US Open. It was his way of drawing attention to the fact that the course set up was over the top. Not very classy, Phil. We’ve witnessed appalling behaviour from both Sergio and Bryson DeChambeau smashing clubs into putting surfaces and damaging them badly. Great role models, eh? At least, Sergio was disqualified – well done the European Tour. 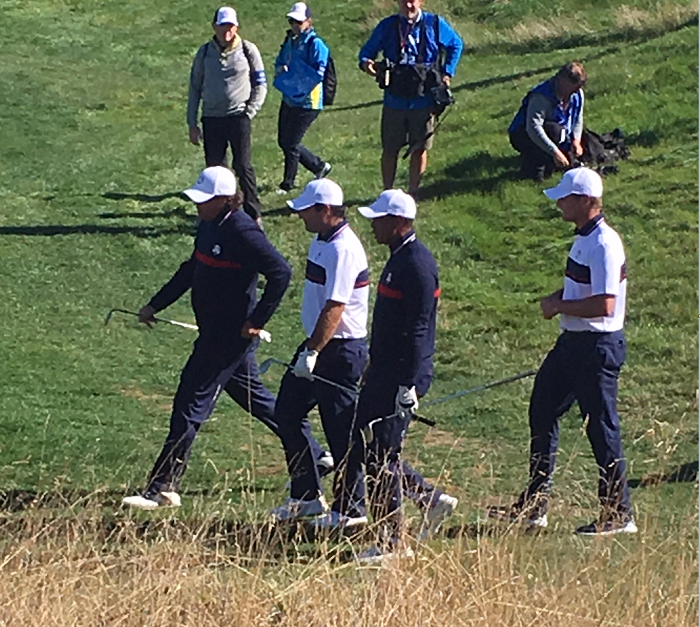 (From left to right) Phil Mickelson, Patrick Reed, Tiger Woods and Bryson DeChambeau. Surely we can expect more from them in how they represent themselves and their sport? Does Rickie Fowler really need to simulate a drop from knee high from below his rear end (see pic at top of piece)? Andrew Landry eruditely called the rules “garbage” and Patton Kizzire called them “asinine”. Is it any wonder that there is a spreading feeling amongst many golf fans that these players are pampered, spoilt prima donnas? The rules are not simply for them, they are for all of us and we want our professional players to display integrity and respect for the game that is undoubtedly bigger than us all. Abide by the rules or work to change them. Enough of playground behaviour. Golf is better than that and deserves better from those playing it and running it. And don’t even mention that dreadful so-called “match” between Mickelson and Woods for an obscene amount of money. Where, oh where, is golf going? Come on game, get a grip. Well said. Please let’s not see the game fall into the football ranks of blatant exploiting of rules until caught. Thank you Maureen. Spot on. The non-DQ of Tiger at the Masters was a travesty. His inner conversation as to the outcome should have been different. Augusta and TV ratings held sway over a ruling which, for any other player in the field, would have been a DQ. I’m not sure that was the start of it, but it did highlight the obsessional coverage of Tiger on TV as a factor in Rules decisions. It is more than regrettable that the pre-eminent star of the game was seen by many of us mere mortals to “get away with it”. I’d bet a great many professionals feel the same way. The arguments over the new rules will be ironed out in time, but the cracks in the veneer of the pro game are getting more obvious. Did that start with Tiger in 2013? Not sure, but it did feel like a step-change in the modern era. As ever, the voice of reason and particularly on the damage to the game’s reputation for self-regulation and the individual’s respect for the rules – or, the way to play and behave. http://www.leith-rules-golf.co.uk where any one interested in supporting the project can donate. Absolutely right on all counts Maureen – it’s a game with rules for everyone- including primadonnas !